MONTERREY, MEXICO (April 11, 2019): WBO Junior Middleweight World Champion Jaime Munguia (32-0, 26 KOs) and mandatory 154-pound challenger Dennis Hurricane" Hogan (28-1-1, 7 KOs) hosted their final press conference today ahead of their 12-round fight for Munguia's title. They were joined by Oscar De La Hoya, Chairman and CEO of Golden Boy, along with Fernando Beltran, CEO of Zanfer Promotions, among others.The event will take place Saturday, April 13, 2019 at Arena Monterrey in Monterrey, Nuevo Leon, Mexico and will be streamed live exclusively on DAZN. "I feel very happy and proud to be here. We have been advancing, little by little. had four very tough world title fights. We've been learning a lot, and we've been gaining a lot of experience during the past year. I also want to say that I will leave everything in the ring this Saturday. I want you all to see a different Jaime Munguia, a better version with better abilities. I want to tell Dennis Hogan that this world title will stay in Mexico. He is not a better fighter than me. This fight is dedicated to all of Mexico!" "I'm happy to be now as my chance to become world champion gets closer. I want to say that as an Irish man living in Australia who is fighting a Mexican in his own land, I am honored. I know that Ireland, Australia and Mexico are great boxing nations with people who always fight with determination and will. So, I know this will be an excellent fight for everyone in the world. I'm happy and proud to be part of it. To put the icing on the cake, I will be going out there to take that world championship. I'm winning on April 13." "Golden Boy has been here before in this great city of Monterrey back in September 2008 when Antonio Pitalua and Jose Armando Santa Cruz fought in the main event. 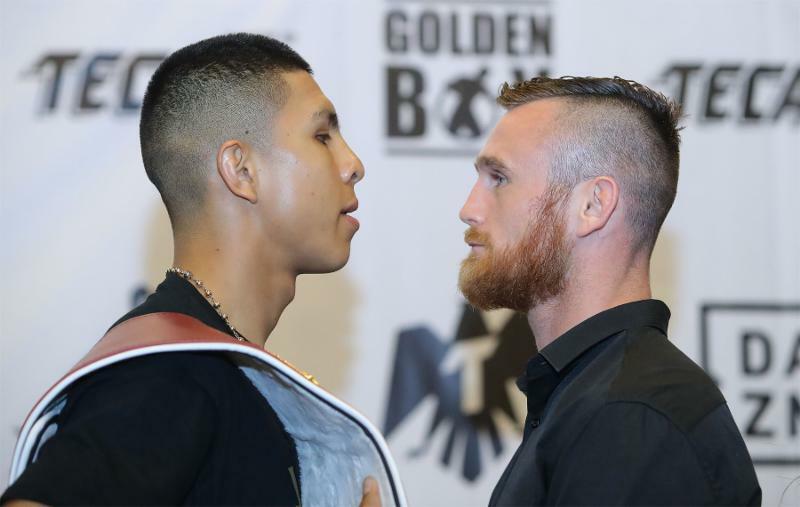 Monterrey, the land of great fighters such as Lauro "El Tigre" Salas and Clemente Sánchez, will be in for a show on Saturday when knockout artist Jaime Munguia faces the tough Australian contender, Dennis Hogan." "Munguia became known to the world by beating Sadam Ali by knockout in May 2018 when he was crowned WBO Junior Middleweight World Champion. Since then, this powerful Mexican warrior has defended his crown three times. Now, he has a very difficult test against Dennis Hogan, WBO No. 1 contender. We know it will be a great battle between two of the best 154-pound fighters in the world." "Also, the co-main event will feature Diego de la Hoya against Enrique Bernache in his featherweight debut. We are also going to present to the local fans the strong Brazilian contender Patrick Teixeira, who will face Mario Lozano in a match for the WBO Latino Junior Middleweight Title. At Golden Boy, we are committed to offering the best fights in boxing." "When I talk about Jaime Munguia, I talk about a young man who I have had the pleasure of knowing since he was a boy. He was a young boy with a lot of dreams. His father, Jaime Munguia Sr., would go to the office and say, 'My kid, he's good!' He will be someone important!" "We helped him with what we could. We helped him during his amateur career. Logically, he debuted with us and he had a great run in different parts of Mexico. We debuted him in Las Vegas where he won by knockout. Then, Golde Boy called us, and gave us the great opportunity with Sadam Ali. We fought him, and then began a co-promotion with Golden Boy. That initiated his jump toward international fame." Title presented by Golden Boy in association with Zanfer Promotions. The event is sponsored by Tecate, "THE OFFICIAL BEER OF BOXING" and Hennessy "Never Stop. Never Settle." The event will take place Saturday, April 13, 2019 at Arena Monterrey in Monterrey, Nuevo Leon, Mexico and will be streamed live exclusively on DAZN. Photos and videos are available for download by clicking here or copying and pasting the link http://bit.ly/MunguiaHogan into a browser. Credit must be provided to Golden Boy for any photo and/or video usage.